Some patients cope with a long hospital stay by bringing a book or their favorite pajamas. For others, soothing music and comfortable bedding can help it feel more like home. 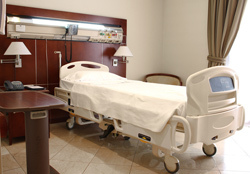 For patients who are required to stay a long time in the hospital, the sterile environment can be draining. Night after night, they dream of sleeping in their own bed, healthy and well again. Jacquelyn Covington, MD is a hospitalist at the Scott & White Hospital—College Station and says she feels responsible to help patients feel at ease. As a hospitalist, Dr. Covington is the physician who cares for patients while they are there and she has seen some creative ways to help it feel more like home. 2. Comforting bedding—bring your favorite pillow, bedsheet, or blanket to the hospital. As you cozy up with something familiar, it can help you feel more like you’re sleeping in your own bed. “I always love seeing pictures next to a bedside and hearing patient’s talk about their loved ones,” says Dr. Covington. Being at the hospital usually means you are experiencing a trial of some sort. As you read uplifting words, you can feel peace and purpose through your hard time. Your hospital will likely have items you need to bathe; however, it can be nice to use a familiar shampoo or your own towel if you’re staying in the hospital. It’s usually an exciting or anticipated event to shower or wash, and grabbing for your familiar towel can make the experience that much better. Music is good for the soul, and especially so when you are in the hospital. If you have a favorite artist or song that brings you comfort, it can be a quick way to get your mind focused on something positive. Also consider bringing a small lamp or ask your nurses to dim the lights for a change. 7. Games or Entertainment—knitting, card games, laptop, book, bring whatever you like to do! One of the most taxing parts of time in the hospital is waiting. As you stay in the hospital, consider bringing things to keep you entertained and if loved ones are nearby, ask them to join in! If your circumstances allow, ask your caregivers if you can go for a walk outside or around the floor. Just seeing a new environment can help lift your spirits. Hospital food is nutritious and well balanced in order to help you get well. If permitted, ask a loved one to stop by your favorite restaurant and bring you a special snack. Having some food or a home cooked meal can help you not feel as homesick. 10. Be Creative—think of what home means to you! Last, think about what makes home feel like home for you. Is it your pet? Perhaps bring a picture of your dog. Or maybe it’s your flower garden in your front yard? Your loved ones can help bridge the gap between the hospital and home by helping you feel happy and comfortable. If you’re looking for ways to make your stay more enjoyable, there are many who are willing to help. Be open with family and caregivers and they can think of more ways make the hospital feel more like your home. Previous Previous post: Why Does the U.S. Spend More On Healthcare Than Other Countries?